Lets start by having you go up to http://github.com/dwm9100b/LsEnhancedTable and grab the latest code for this project. Make sure you right click on the downloaded zip, go to properties, and click on the Unblock button before unzipping. That’s all we’ll have to do with the ‘Server’ part of this project. The rest of the tutorial will be with the HTML Client. Lo-Dash which is an awesome, lightweight alternative to Underscore.js. They’ve even included a ton of extras. Highly recommend that you check it out! We now automagically take care of step #5 for you when you install the NuGet package. Great! That’s all the pre-work needed. Now lets go create our screens. Good time to do a full build and test run your app. Test the out of the box functionality. Ok, enough of that. Lets supercharge this table! We start off by creating a few local properties via the Add Data Item. Uncheck the “Is Required” on all you create. Go ahead and save your solution and do a build. Now on to the code, this will be the painless side of it. Not too many lines of code now is it? Would be great if someone out there creates a screen template! Try the one click clear all, less server trips! So whats missing and left to do? Please, hepl me with this problem! I am using database tables, but I am getting “Cannot read property ‘filter’ of undefined”. I cant see any data at all? Any idea what went wrong? Hi this is my first time using lightswitch and your extension. It is great but I am facing a problem. Please see if your guys can help, thanks! In my project there are two tables one is “Employee” and another one is “TransactionRecods”, they are related by the PK emp_Id in employee table and an emp_id field in transaction records table as FK. First i created a screen which includes a table to display list of employee, I can apply the enhanced table successfully, just like the example given above. When an employee record in the table is clicked, user will be navigated to the second screen and the second table will be displayed – to show the transactions of that particular employee – I failed to convert this table into an enhanced table. – I tried to new itgLs.EnhancedTable in the postRender function of transaction table, I found that getting value of “properties.dataSourceName” produced an error because “options.contentItem.model.dataSource.member.source.target.source.member” is undefined, lightswitch seems using some other ways to manage linked tables. I am still investigating a solution to solve this, but if you guys have faced it already please show my your way! sorry for the long post and thanks in advance! First of all, thank you for your help and very quick reply.. I managed to do it a similar way like you suggested but there is another problem which has raised now. “Cannot read property ‘filter’ of undefined”.. This happens only when custom control column is in table. If I delete it from table, everything works perfectly so I assume that there is something more to do..
Ok, I managed to adjust script according to my needs and also found some bugs.. The above code should be right below the following line to avoid some filter error.. I also added suggested code right below the mentioned if as I have to ignore the custom control..
Now this part works fine but there is one more problem which I can now see.. When I first load table.. it has its query with custom parameters set.. 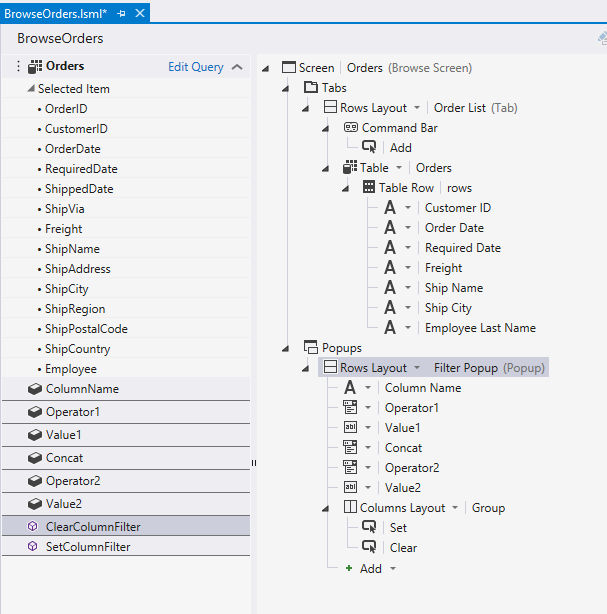 When I first set or clear any filter.. those custom parameters just disappears..
To explain on the example.. Let’s say I have the Entity People and when the screen is loaded I load only People who are 18+… and that works with the custom query made with designer.. When I set the filtering, it just filters the whole datasource, ignoring my 18+ condition. Does anyone have a hint about the problem?? //only override once – have we done this already? I have two tabs on one screen. Anyone knows how to solve this? I wonder where you should put this code? I added the code above and the code in http://joshuabooker.com/Blog/Post/8/Monkey-Patched-LightSwitch-Screen-Collection-Queries but with no luck. I dont know if this because I am using one screen and two tabs. Any ideas? Hi Dale, thank you for sharing this!!! Any ideas how to fix the header row when user scrolls the table? You mean to freeze the header row? It’s a way to override the collection query while still maintaining the parameters from the screen designer so it works on parameterized queries as well. 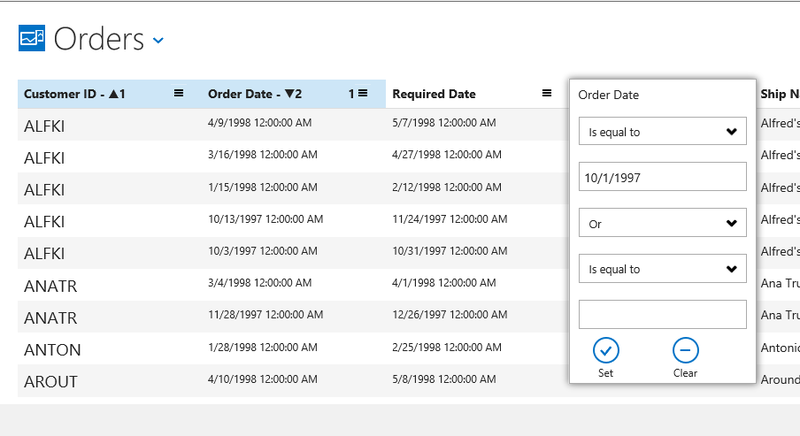 For example, your enhanced table can be used on a table based on a query. Nice Dale! Cannot find the code on git though. Q: Filters across columns are ‘And’ style correct? If you leave a filter val blank does it handle nulls? 1 – It would be swell to have an init option to set the base filter. Say you want to use this on a screen that only displays Open Orders. 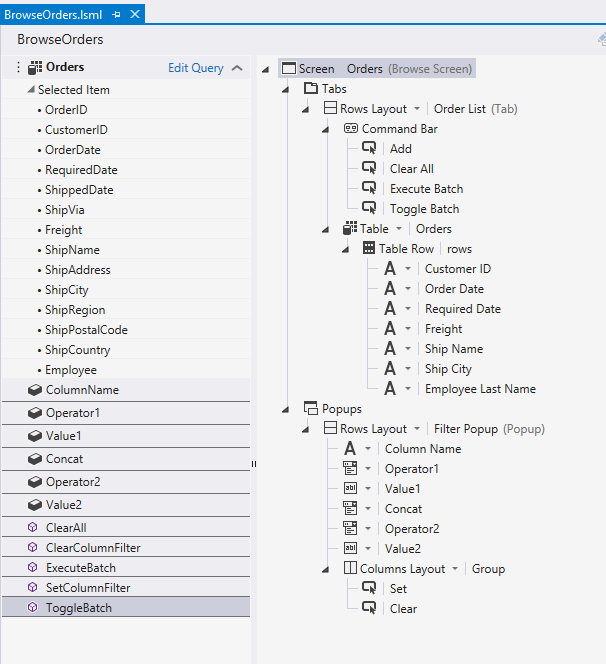 Since you’re overriding the base query from the designer, you’d have to append ‘Shipped eq false’ to the dynamic query. The ‘base filter’ would stick when you clear the dynamic filter. Don’t know if poss, but it would be really cool to get the base filter from the designer query. 2 – Make the filter popup display the entire filter across all fields. This would be a bit of work, but you’re so close. You know, like the query designer…display a list with one or more rows having the property names in pickers. Add another row preceded by AND\OR, etc. This would enable ‘OR’ across fields. Complexity of Grouping wouldn’t be necessary to replicate the current capabilities of your control. Your work is really great, keep it up! PS…To OData spec: why is order of arguments in substringof backwards?…it’s silly isn’t it? Thanks for the feedback Josh. Sorry about the git issue, I’ve fixed the link. Currently across columns I’m only doing an “And”. Grouping gets to be quite messy and have not found a good working method on accomplishing it. I’ve thought about the bigger popup and will think how to do inline editing. Re nulls… yes its handled. If a value field is null (blank/empty) we skip the filter processing for that field. Are you looking for null filtering? And yes that OData spec is a mess… thanks again for the feedback… holler with bugs that popup. but forcing parenthesis around each field filter should at least allow OR across fields. base filter init option should be easy enough, no? except the part about getting filter from designer query, I don’t think that’s even in the model since queries become function in the data service (I think?). We already do grouping of the column filters, so its a matter of the UI and where to put the conditional between columns. I’ll be updating later today an update that will include setting a default filter and sort. Awesome Dale! Keep up the great work! PS… I havn’t tried this yet, but the Name and State query parameters are not required for dynamic table filtering, correct? I presume they were present in the query for other reasons, but the enhanced table only needs two parameters sortstring and filterstring, correct? also, why is filterStringPropertyName not required in step 19? Correct… The query parameters are not required. They were left in to show how easy it is to remain with query parameters for filtering yet have the multi column sorting. Step 19 shows this and hence no filterStringPropertyName is required. Its more about options and not forcing the dev to totally abandon what they know. Appreciate the thanks, but attribution not necessary. Just please vote on uservoice if only so team samples don’t have to include so much complicated linq expression building code. 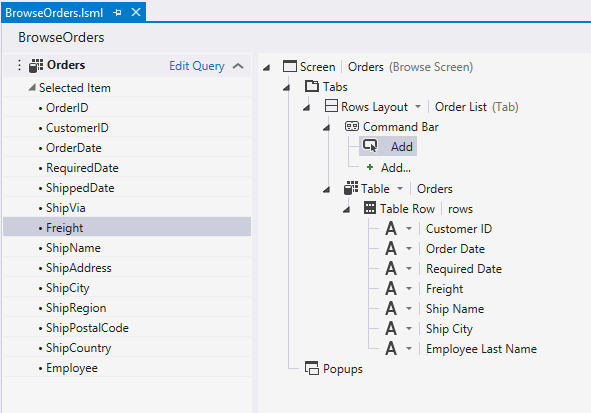 We all know how to filter and sort using T-SQL and this is a RAD tool, right? 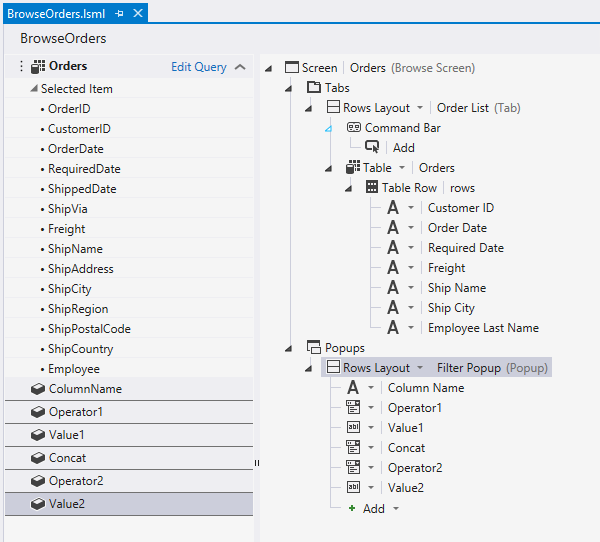 Hope dynamic linq allows you to expand this to enable multi-column sort and filter! Using these extensions, you can sort and filter by a list of fields. I think it would be swell if these extensions were included in LS OOB.